Posted 3:26 pm by & filed under Beduin, Personal Experiences, Study Tour Reports. On a recent 11-day tour of Israel and the West Bank, under the aegis of ICAHD, many instances of the worsening situation for Palestinians were witnessed. People who had visited the region before said they had never seen the Palestinians so despondent. The impunity with which the Netanyahu government continues to squeeze the Palestinian people out of their native land to make way for more settlements encourages it to turn the screw ever tighter on the hapless indigenes. It was therefore heartening to come across the occasional example of non-violent defiance in the face of overwhelming odds. One such example was incarnated in the person of Khalil Al Amour, a maths teacher, law graduate and irrepressible activist on behalf of the Bedouin of the Negev desert. 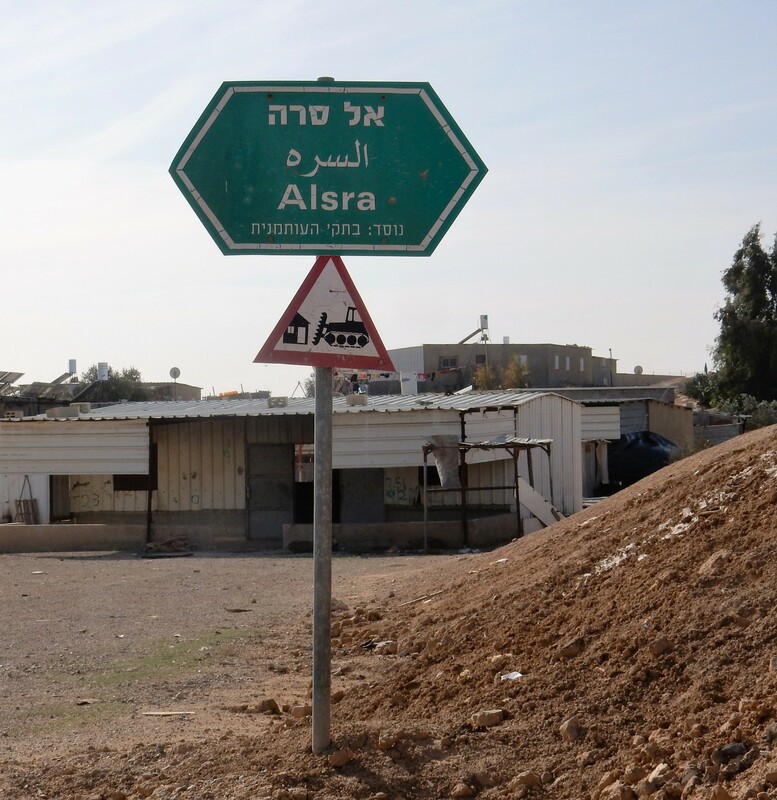 Khalil joined our minibus and guided us to the village of Umm al-Hiran, which the government wants to demolish to make way for a new Jewish town, to be called simply Hiran: thus, as Khalil said, ‘killing the mother’ (umm is Arabic for ‘mother’). As we travelled, Khalil explained the history. Umm al-Hiran is several kilometres from the larger town of Hura, the scene of a big demonstration in November 2013 against the Prawer Plan. The Prawer Plan, formulated in 2011, called for the expulsion of 70,000 Bedouin citizens of Israel from their ancestral lands in the Negev. The Bedouin in Umm al-Hiran were moved here from Khirbet Zubaleh in the region of Rahat, a more fertile part of the Negev, in the 1950s, to make room for a Jewish kibbutz, Kibbutz Shoval. Israel wants the world to believe that Bedouins are nomads and only live in tents; that they came from elsewhere and are only transient in the ‘Land of Israel’. In fact, the Bedouin have lived in the Negev for centuries. And they often live in houses, in settled communities. Because their village is unrecognised, they get no services: no water, no electricity, no schools, no sanitation, no clinics and no paved roads. If the Bedouin try to lay water mains themselves, the Israelis send in machinery to rip up the pipes. A kilometre or so away from Umm al-Hiran is a dog hotel and pet cemetery that has all the water and electricity a dog could want. As the writer and journalist Jonathan Cook (whom we were to meet later on our tour) says, it’s ‘better to be a dog than a Bedouin in Israel’. When the Bedouin were first moved here in the 1950s, said Khalil, they were told by the Israeli government that it would be ‘just for 6 months: we need the land because of the war with the Arab countries. After 6 months you can come back. This is only temporary.’ Because it was ‘temporary’, the Bedouin were not given permission to build. But temporary turned into permanent: Israel declared the Bedouins’ previous territory ‘state land’ and their return there ‘impossible’. Now it wants to remove them from their ‘temporary’ village. The villagers have appealed against the removal order, and are awaiting the court’s decision, which is imminent. Meanwhile, the bulldozers are perched on the hill ready to descend on the village and claw it up. A decision favourable to the Bedouin is not expected. Khalil introduced us to Abdul Hamid, head of the family of one of the threatened houses. (As usual in Palestinian homes, mischievous bright-eyed children were running everywhere.) Despite their straitened circumstances and the anxiety to which they must be constantly subjected, they had prepared a prodigious casse-croûte for us. To contemplate the trouble and expense they must have gone to was to marvel at the generosity of the Palestinian people. Encouraging, too: if they can hold their dignity in the shadow of the D9 bulldozers, they must surely find peace and security in the end. Khalil then took us to his own village of Al-Sira, where his wife had prepared a lavish lunch. The village boasts a sign that bans bulldozers, beneath official-looking lettering proclaiming the village name in Arabic, Hebrew and Roman characters. ‘Founded in the Ottoman period’, it declares, implying, ‘You don’t recognise me, but I recognise myself.’ There has been a longstanding tussle between the Israeli authorities and the inhabitants of this village, championed by Khalil. There is an additional reason why Israel wants to see the back of Al-Sira and all it contains: the military airbase of Nevatim is close by. The construction of this base, said Khalil, happened after Israel withdrew from Sinai in 1982 as a result of its peace treaty with Egypt. With the whole of the Negev to choose from, they decided to put the base here in the middle of a Bedouin community. There are two big cemeteries that can’t now be accessed, because the airbase intervenes. On rare occasions, the army opens the cemetery, but they never publicise this in advance. In 2014, after 36 years of exclusion, the villagers were allowed to visit the cemetery, because a fierce storm had disinterred some human remains and bones were littering the place. So Khalil was permitted to put the cemetery to rights; he seized the occasion to visit his old school for the first time in three and a half decades. Ten of the Bedouin villages have been recognised, said Khalil. In 1948 there were 90,000 Bedouin. After the Nakba this number had shrunk to 11,000; the rest had been massacred or exiled. Israel squashed this remainder into a much smaller area than they’d lived in before. Israel has declared itself willing to give the Bedouin 2 per cent of the land, even though the Bedouin now number 200,000. Despite Israel’s intransigence, the Bedouin refuse to be enemies. The Israelis’ plan was to confiscate the land and send the Bedouin to seven towns that were already full. They came to realise that they couldn’t implement this scheme, and so they’ve withdrawn it. All the seven recognised Bedouin towns are on the lowest rung of the economic ladder. They’ve placed Hura at the top of this miserable tier. It proves that the policy of urbanising the Bedouin by force won’t work. Israel will go ahead with it none the less, because the sole aim is to take the land. Even for the villages it does recognise, the Israeli government will not do anything. In the unrecognised villages, on the other hand, Israel is very active. 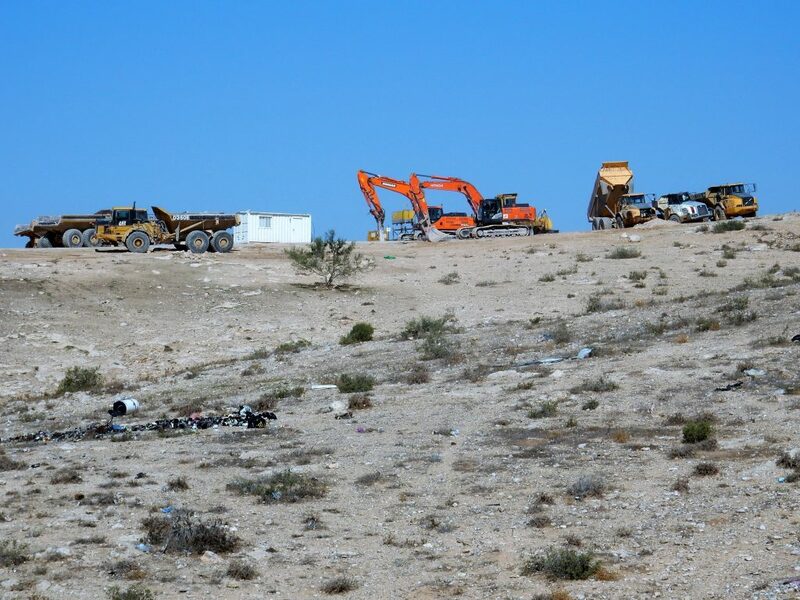 If the Bedouin in these villages cultivate the land and sow seeds, Israel ploughs up the land and in some cases has been found to drop poison on it from planes. Even in the recognised villages government schools were not connected to the grid. When the High Court gave an order for the schools to receive electricity, the government just gave them generators. After going back to the High Court, they finally got connected to the electricity supply, after three years of trying. As well as actively resisting Israeli encroachment on the lands and lives of his Bedouin community, Khalil has made superhuman efforts to make the lives of himself, his wife and their seven children as tolerable as possible. Before inviting us into his house, Khalil showed us some of the remarkable bricolage he’d performed on it to make it not only habitable but, in this deprived environment, luxurious. He’d cultivated a profuse display of cactus in his front yard, rigged up an internet-reception system too complicated for me to understand (I think he even had broadband), engineered a way to recycle waste water to irrigate his plants, raised egg-laying chickens and, if I remember right, at least one goat, and – most miraculous of all – his own electricity supply: some huge batteries concealed under a mattress and linked to solar panels. He’d even run a cable off the latter to supply his neighbour’s house with current. The effect of all this enterprise in the face of so much maleficent obstruction from the Israelis, and after all the deprivation we’d witnessed that morning, was heartening, to say the least. And there was more to come. Khalil had been in receipt of demolition orders on more than one occasion, but he’d managed (I don’t know how) to get the order rescinded. This is quite an achievement. 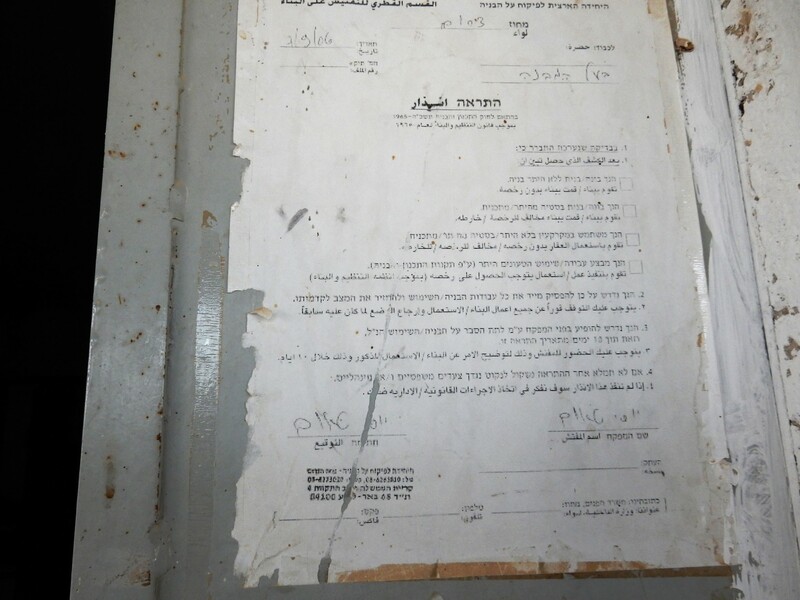 Although Khalil can produce a document confirming his family’s purchase of the house in 1921, Israel doesn’t usually recognise any title deeds prior to its own foundation in 1948. The demolition order, now defunct, was displayed on his front door, where it had been originally posted. Here was a man who would not be defeated. A mere Bedouin, he’d triumphed over all that Israel could throw at him. His dogged persistence, practical ingenuity and fertile imagination have enabled him to transcend the dire circumstances of his life. A true kindred spirit of Martin Luther King. *Please note, as of 17/01/16, the Israeli supreme court upheld its decision which means that the state can demolish Um Al-Hiran and Atir at any time. Please read the Negev Coexistence Forum report on this here. – Article by John Garrett, UK. I know less about the situation than I ought, but for years I have despised the treatment that right-wing Israeli governments have meted out to the Palestinians in terms of land occupation. To my untutored eye there seem to be desperately ironic parallels with the Holocaust. If anyone should have sympathy with oppressed minorities it is the Israelis. I feel so sad that liberal Israeli voices, of which there are no doubt many, have little impact on their government’s behaviour; also that, conversely, the blinkered pro-Israeli lobby overseas has such an ability to muzzle Western governments.